Raw food diets are great, but most dogs refuse to do the dishes! 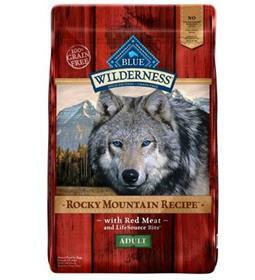 Blue Buffalo Wilderness Rocky Mountain Recipe with Red Meat Adult Grain-Free Dry Dog Food is an easy-to-serve, super-healthy alternative to the raw food mess. Every bite of this grain-free kibble is packed with protein, veggies, and fruits, and since it's free from byproducts and harmful additives, you know you're giving your buddy a healthy meal perfect for daily feeding. Ingredients: New Formula: Deboned Beef, Chicken Meal (source of Glucosamine), Peas, Pea Protein, Tapioca Starch, Pea Starch, Menhaden Fish Meal (source of Omega 3 Fatty Acids), Chicken Fat (preserved with Mixed Tocopherols), Pea Fiber, Flaxseed (source of Omega 6 Fatty Acids), Natural Flavor, Dehydrated Alfalfa Meal, Deboned Lamb, Deboned Venison, DL-Methionine, Dried Chicory Root, Choline Chloride, Potatoes, Salt, Calcium Carbonate, Dicalcium Phosphate, Caramel Color, Potassium Chloride, preserved with Mixed Tocopherols, Sweet Potatoes, Carrots, Zinc Amino Acid Chelate, Zinc Sulfate, Ferrous Sulfate, Vitamin E Supplement, Iron Amino Acid Chelate, Blueberries, Cranberries, Barley Grass, Parsley, Yucca Schidigera Extract, Dried Kelp, Turmeric, Nicotinic Acid (Vitamin B3), Calcium Pantothenate (Vitamin B5), L-Ascorbyl-2-Polyphosphate (source of Vitamin C), L-Carnitine, L-Lysine, Copper Sulfate, Biotin (Vitamin B7), Oil of Rosemary, Vitamin A Supplement, Copper Amino Acid Chelate, Manganese Sulfate, Taurine, Manganese Amino Acid Chelate, Thiamine Mononitrate (Vitamin B1), Riboflavin (Vitamin B2), Vitamin D3 Supplement, Vitamin B12 Supplement, Pyridoxine Hydrochloride (Vitamin B6), Calcium Iodate, Dried Yeast, Dried Enterococcus faecium fermentation product, Dried Lactobacillus acidophilus fermentation product, Dried Aspergillus niger fermentation extract, Dried Trichoderma longibrachiatum fermentation extract, Dried Bacillus subtilis fermentation extract, Folic Acid (Vitamin B9), Sodium Selenite.